It must seem to newcomers in our world of aviation that the folks, who flew in back in 'the day', must be conspiring to weave a universal tall tale about how aviation was in the old days. They then take turns telling it while the rest of the codgers nod in solemn assent. In these times of six and seven dollar avgas and single engine piston aircraft pushing three quarters of a million dollars, it's hard to visualize a world of forty cent fuel and affordable airplanes that factories were pumping out like popcorn. To imagine a time when we had the freedom to fly just about anywhere in almost anything, and when almost anyone who was working could afford an airplane of some kind. To those of us who lived and flew during those halcyon days, it only seemed normal. Most of us thought that these times would continue always and that they were only our due. It also seemed to us, me anyway, that aviation was probably about the same in every progressive country and I really had no idea what an oasis of aeronautical privilege we were living in. But in the mid seventies I had a jarring epiphany. I was able to view of our amazing aviation scene here in the US in comparison with other countries. I was able to get a glimpse of aviation in the UK and Europe close up, and see firsthand that it was mostly for the wealthiest. If you can stand a circuitous route to the point I want to make, I'll tell you the story. In the spring of 1976 I was taking a break from flying and spending several weeks touring the UK. I was doing this while morosely contemplating the wreckage of my life, since my little world of aviation had imploded that winter. Alas, my rascally accountant had made off with the corporate purse and my flying service had tumbled down around my head. Airplanes, employees, hangar, shop, charter service and Piper dealership were all gone, and my ability to make a living along with it. The banks had swooped in and also taken everything that was worth anything that I owned personally and I had little left other than my clothes. It was pretty apparent at that point that I had reached one of life's mileposts. I needed take stock and decide what the rest of my life would look like, and I needed a change of scenery to help me do that. About that time a check showed up from my bank, the proceeds of a closed out and forgotten account. I remember holding the check and thinking that it wasn't enough to change my new and admittedly horrible lifestyle, but it was enough to take a trip overseas to think about things. Without hesitating I purchased a round trip ticket to London and started filling my back pack with the things that I would need for a month of travel. I hitched a ride to JFK with my friend Jake who had a charter there in the King Air and caught my flight to Heathrow. Soon I was in London and hiring a car, as they call it there. 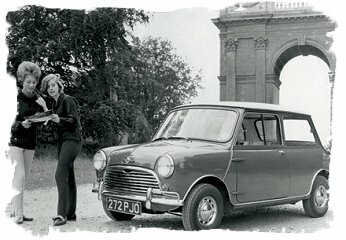 I was given a Morris Mini, which looked much like the present day Mini's; except it had wheels so small it made the car resemble a roller skate. I had seen pictures of them, but never had seen one for real, and certainly not one with the driving position on the right (wrong) side. I stowed my gear in the boot (trunk). I set off with great apprehension, steering from the wrong side of the car, shifting with the wrong hand and flinching as cars came at me from the wrong side of the road. Roundabouts were completely mind boggling and I approached each one with fear and foreboding, very appropriate feelings for the melee that they proved to be. After a few miles of this and several shots of adrenalin in response to cars coming around a turn on 'my' side of the road, I stopped to fill up the gas tank at a petrol station and attendants swarmed the tiny car. With the tank full, fluids checked and preflight complete, I stepped in the office to settle my bill. Back outside I jumped back in the car and stared dumbly at the dash board in front of me. The steering wheel was gone. Looking to my right I found it, smugly attached to that side of the car. I looked to my left and saw three smiling petrol attendants giving me their unblinking attention. Thinking quickly, I opened the glove compartment and sorted through the documents there, as though I were looking for something vitally needed to continue driving. Clutching the owner's manual I jumped out of my seat and ran around to where the steering wheel was waiting for me and quickly sped away, blushing to my hair roots. Well into the Northumberland country side now, I was delirious with the richness of rural England. Stonewalled farms swam by as the two lane road twisted across the rolling landscape. As I rounded a bend and came out upon a long valley I saw a runway. Not just a runway, it was an aerodrome, right out of WWII. There were Quonset Huts and aging hangars, their interiors guarded by shadow, and crossing Emerald runways that lacked only landing Spitfires to convince me that I had traveled back in time. As I pulled into the parking area one of the strangest and largest gliders that I'd ever seen was being pulled from one of the hangars by a half dozen or so smiling men. I introduced myself as a pilot from the US and much to my confusion, became a sort of instant celebrity. They gathered about me in a circle and asked many questions about what flying was like in the States, one after the other submitting their inquiries, as if this was a very polite interrogation. Then they showed me their glider, which was the only aircraft on the aerodrome. It was a two place, side by side affair, the open cockpit of which resembled a 30's English Roadster and you sat in it up to your ears in airplane. The wing span was enormous, at least 60 feet and as I looked it over they asked me if I'd like a ride in it. Yes, of course I would, so it was trundled out to the runway, hooked to a double decked bus which had been converted into a winch and off we went for a short but memorable silent tour above green. Their hospitality didn't stop there; I was to operate the winch so I did and logged what would be my career's only winch tow. When it was time to say goodbye I shook hands with these men, whose fervor for the sky humbled me. One of them said to me, 'Oh I wish you'd been here last week; we had a powered airplane come in'. I never forgot that statement and how it brought home just how privileged those of us who love the sky have been in this country. My sorrow is how much less accessible US aviation is to the average person these days. My hope is that we never arrive at a place where a visit by a powered airplane is an event.